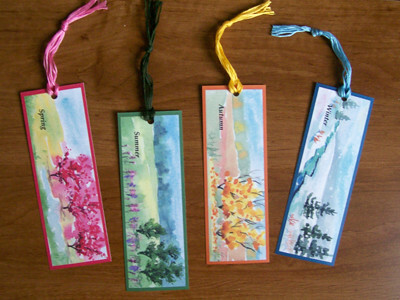 Nature Bookmarks Available – Let's Paint Nature! Each bookmark is printed on 80lb cardstock and laminated, also comes with a tassel. These bookmarks are prints and not originals, therefore the colors you see on the screen may not match exact colors printed out. Bookmarks are $5 each or you can purchase all 4 bookmarks for $15. That’s getting one bookmark for free! Shipping and tax is included in the price. To purchase, see the new bookmark page of this site. They can make great teacher’s gifts for Christmas…OH…I said the “C” word and it’s only August! Ok, in other nature news, the first week of the Weekly Sketcher art and phenology project has been published. One post will publish per week for 52 weeks. Each post has a sketch and description on the weather and surroundings at the Little Red Schoolhouse Nature Center. It is my little historical document of the seasonal changes from Aug. 2009 – Aug. 2010. It’s a bunch of fun to see changes from week to week, I hope you enjoy reading them. Lastly, in nature news, I will be hosting a free Sketching in Nature classes every last Saturday of the month (unless specified) at the Little Red Schoolhouse. You can read class description and find a supply list on the “classes” page. The next one is soon…Saturday, August 28th! Join me with your sketchbook and learn how to make complicated landscapes into simple watercolor sketches. We are all beginners so don’t worry if you think you are not talented enough! Hope to see you there. Beautiful bookmarks! Wish I could attend your class! Cool on the class & I love the idea of the monthly posts–looking forward to that. Gonna pop over & buy me a set of those bookmarks now–they’re so very lovely! those bookmarks are a fantastic idea. I’m gonna check out your project now. Joan: Thanks! I wish you can sketch with me too. Lana: Thank you 😀 !!! They are on their way, I hope you like them. Charu: Thank you very much! I’m glad I can help, I would love to see your paintings. Keep on painting and never stop. Artswebshow: THanks! Hope you like the weekly sketches.